Yammie's Glutenfreedom: The Best Gluten Free White Bread! 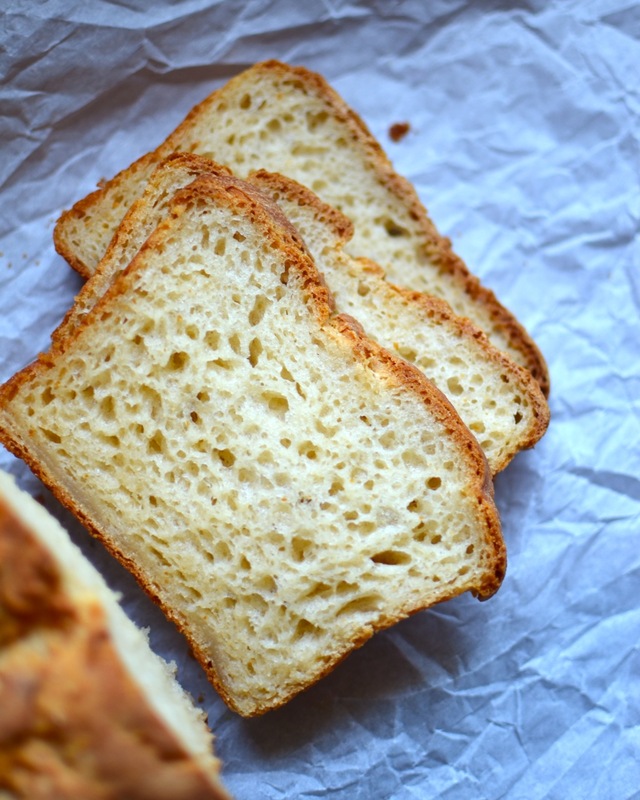 The Best Gluten Free White Bread! 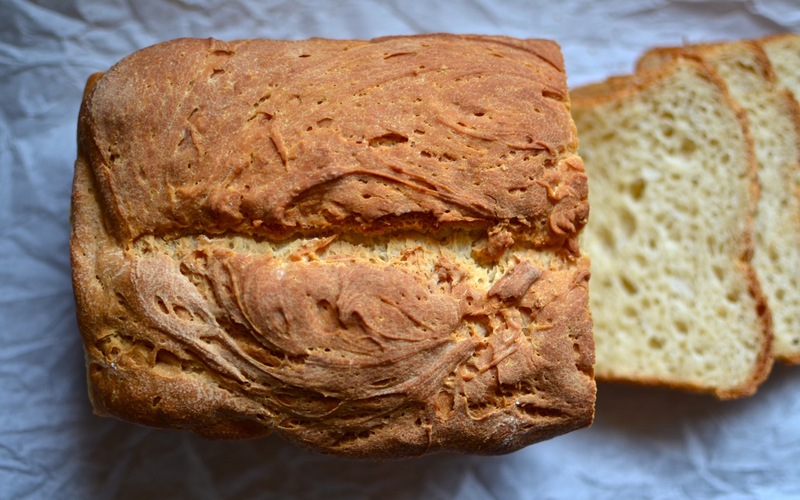 When I ask you all what the one thing is that you've missed most since going gluten free, I have a feeling that a resounding cry will go up to the heavens of "warm, homemade bread". You miss that chewy, soft texture, that crunchy crust, that warm, yeasty aroma. You want crunchy, golden brown toast, not a crumbling heap of "bread" with jam. You want a good ole reliable sandwich, not a brick of disgustingness that tastes like rancid beans and sticks to the roof of your mouth. You want warm bread, right out of the oven with butter melting into all the crevices, not a big eggy mess that squishes under your bread knife. This recipe is actually based on my pizza crust recipe which was based on this Udi's Copycat Recipe. I love Udi's, but this... this is much, much better. I call this bread "batter". It's really not doughy like gluteny bread dough. 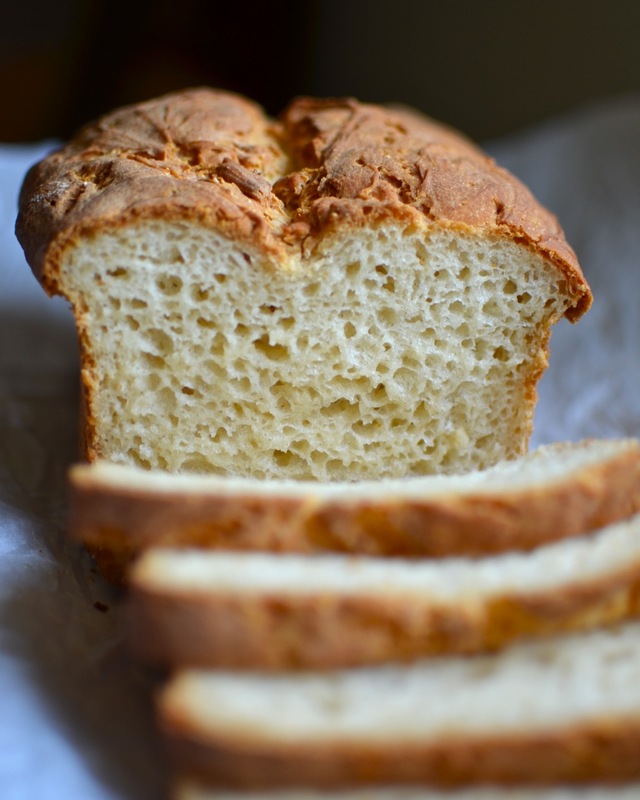 Also unlike gluten bread, gluten free bread does not need to be kneaded... it only needs to be needed (sorry). You just beat it up, flop it into a greased pan, let it rise once, and then bake it! If you don't believe me that this bread is totally awesome, let me just tell you that my older sister... the bread connoisseur of this family, the sister who sneaks out in the dead of night to spy on all the bakeries and learn their secrets, the sister uses baking stones, sourdough starters, biga, poolishes, and all the other weird things that only true bread fanatics know about... that sister claims that this bread is some of the best she's ever tasted. In a large bowl combine the water and yeast. In a separate clean bowl, beat the egg whites to stiff peaks. After one minute, add the brown sugar, olive oil, and vinegar to the water and yeast. Once the egg whites are stiff, slowly pour in the water mixture while continuing to beat on medium speed. Mix together the flours, starch, xanthan gum, salt, and baking powder and add to the wet mixture. Beat for one minute until smooth. Pour into a well greased bread pan. Let rise in a warm, moist place until doubled (about an hour). Score the top if you want with a sharp knife. Bake at 350ºF for about 45 minutes. Allow to cool before cutting (if you can bear the suspense). If you're not going to use the bread immediately, you can freeze a sliced loaf and just get out a slice as needed and let it thaw on it's own, in the toaster, or in the microwave. If you don't freeze it, it will dry out in a day or two. This looks wonderful and I'm anxious to make it. My husband was just told to avoid potatoes, corn, flax, and wheat. Since there is already tapioca flour in the recipe, what can I substitute for the potato starch? Thank you! 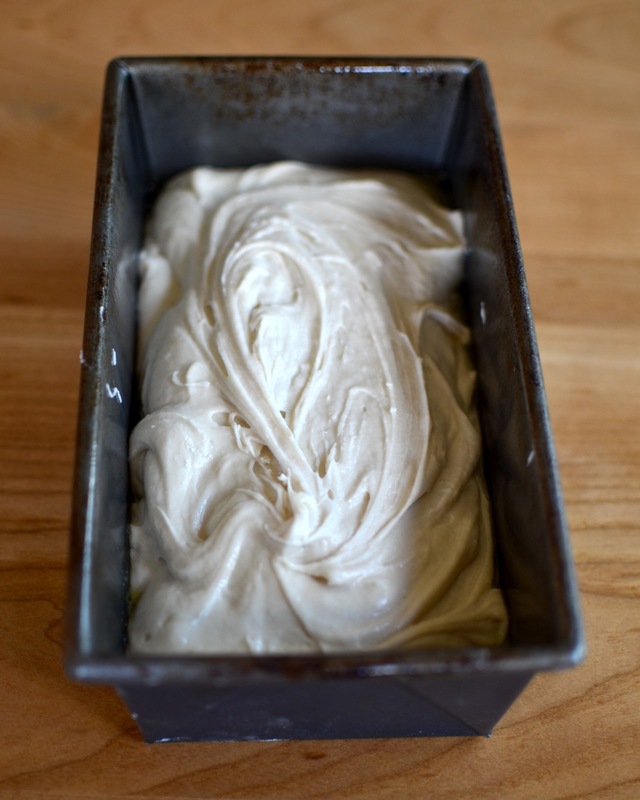 Try Arrowroot starch for the potato starch, and use guar gum to replace the xanthan gum (which is made from corn). When adding the dry ingredients to the mixture did you switch attachments from the whisk to the paddle or the hook. I plan on making this recipe but am a little confused. Replacements for the tapioca starch? Or is there something about tapioca that is essential for the end result? Firstly, I am THRILLED to find this recipe. I made this last night. The bread texture inside was lovely, and I finished more than 3/4 of it today! Grilled it to make a lovely sandwich too. But, my crust was wayyyy too hard. Infact I cut my finger trying to cut it into slices :( Also, another problem was that I didn't end up with a batter-like dough. In fact, when I kneaded it with the knead attachment on my stand mixed, it was dry and crumbly as I added the dry ingredients. I ended up having to put more more water until it was a bit battery. I put the bread on the middle rack in the oven and baked for 45 mins. Couple of things I did wrong were adding the egg whites to yeast mixture instead of the other way around. Does that make a difference? And also, it was like 12 am so I only let the bread rise for half n hour instead of whole. Kindly help! I can't wait to make this again. Once again, eternally grateful for this recipe. Can I get away without adding the sugar? 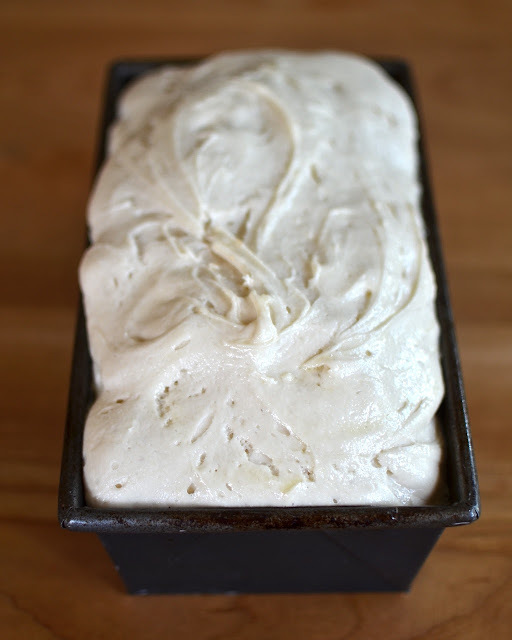 I'M MAKING THIS BREAD THIS WEEKEND! CAN'T WAIT. It should work fine. Good luck! This bread looks terrific! I plan to try it soon. Out of curiosity, why do you use baking powder and yeast together? I've seen that a lot in gluten-free breads but never in gluten ones. Lately I've been interested in getting down to the root of gluten-free baking and how recipes work. This is probably a stupid question, but what is the science behind using baking powder and yeast together? Absolutely delicious bread! Thank you so much. It is my go to bread now. I won't make anything else. I made this yesterday, so so good. The whole family loves it and can't believe it's gluten free. It tastes way better and the texture is much better than the bread we buy at the bakery. Thank you very much. Sooooo, I made this bread to day and made only one substitution :|! I didn't want to, as when I make things from recipe for this first time, I like to follow it to the letter to make sure that I am making it exactly as it should be done. Because I did not have potato starch, I thought I was in a lurch, but being that I had plenty of oat flour, I did some research and decided to give it a go. 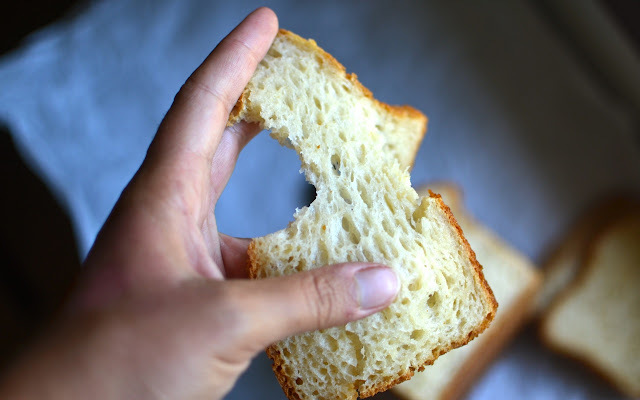 It was an excellent substitute for the potato starch, and it SERIOUSLY made the best sandwich bread that I have ever had. I will try it as hamburger and hotdog buns, but will need to find the right pans or course! Thanks for posting such a spot on recipe, and I will be sure to share this with others! I think I used a ten inch pan. It's the same kind I use for banana bread. Try reducing your liquid by 2 tbsp at a time. I used to have this problem. It could have to do with your elevation (or lack thereof) compared with the person who made the recipe. If it's too liquidy (even just slightly), it will rise up really nice, then sink, because the bubbles burst through the liquid. You need it too be *just* stiff enough to keep the bubbles in, but not too stiff (ie, still needs to be liquidy enough) to prevent the bread form being too dense. Once you find that magic "dough" texture, it'll turn out great! I made this tonight and it is so good! I can't believe it's gluten free! Thanks for an amazing recipe! I cannot believe how light this bread is! I made it last night for my GF daughter. It's so soft, flexible & amazingly delicious. I have tried different recipes stating it's the best when it really wasn't at all. We can't thank you enough! I made your blueberry muffins last week. They were incredible! I trust your recipes 100%. ThankYou, ThankYou ThankYou from the bottom of our hearts! Can I bake this using a bread machine ? What would I do differently or is it better to bake in the oven ? 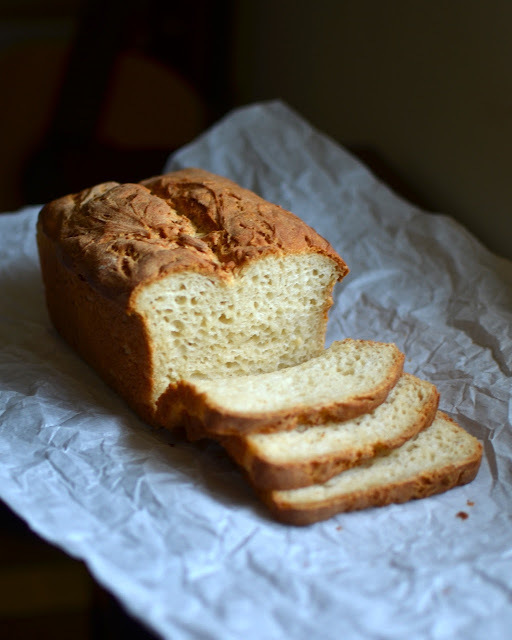 Since discovering this recipe, I've made this bread many times! My gluten free sister from another mister from Church loves this so much! I shared the recipe with her and I hope to continue sharing your wonderful recipes with other outstanding people. They have literally totally me that they feel life again, and I can only attribute this to you. Your fine research is paying off in amazing ways. I don't use gums and was wondering if I could use ground flax instead.